The first “real” hoteliers I ever worked for owned and operated independent, familyrun inns and other related hospitality businesses. They had learned to be frugal, having lived through very hard times in World War II and the subsequent years as the economy grew and recovered in the decade that followed. When recently looking at a client’s income statement and examining it for potential cost savings, I noted a number of things they practiced that have merit today, but many hoteliers often overlook these simple measures. These simple, but cost-saving steps can be especially valuable in small properties and are offered as ideas for consideration. 1. Eliminate unnecessary printing. Often we print a document that has unwanted advertising or a single line on the last page (think about what happens when you print up directions from MapQuest for a guest). This can be addressed by using software that can predetermine this waste of paper and ink. Always click on “print preview” before clicking the “print” button to ascertain how many pages will print and if they are all necessary. True savings start by becoming more cognizant of the actual cost and impact that extra paper and toner has on your bottom line. Make it a habit to start looking a bit closer at your print jobs. 2. Buy environmentally friendly paper. Yes, we still need paper, so look for environmentally friendly but cost effective options. Printer and copier paper made from recycled paper from 100% post-consumer fiber is the best option. This is paper that has been manufactured from recycled paper and wood products. No new trees have been consumed in this process and hence the paper is often less expensive. Another key advantage of using recycled paper is that it can be made easily with less toxic processes, and thus results in less pollution. Many times lesser known brands of paper may afford the best low-cost option. 3. Copier and printer settings. Verify that copiers and printers automatically default back to single copies after someone has printed multiple or duplex jobs. Whenever possible consider printing double-sided to minimize paper usage. Never print in color unless color ink is needed. Page for page, color ink and toner cartridges will run out four times faster than black cartridges because there are four colors in a color cartridge. They are also more expensive than black ink cartridges. 4. Buy re-manufactured ink and toner cartridges. Not only do these refilled and/or re-manufactured cartridges cost 15-25% less than new ones, but each reused cartridge saves a couple of pounds of metal and plastic being deposited into a landfill. It also takes almost half a gallon of oil to manufacture each toner cartridge. Most office supply stores gladly accept used toner and ink cartridges for recycling. Additionally, many manufacturers of these items have recycling programs in place or offer postage paid shipping labels to ship your used cartridge back in the box the new cartridge arrived in. Remember, recycling keeps the costs of these items lower for everyone, while minimizing unnecessary deposits in crowded landfills. 5. Re-examine office equipment at replacement time. All office equipment produces toxic substances in the manufacturing as well as the disposal stages; so the fewer office machines used by your office means the smaller your carbon footprint can be. There are many ranges of multi-tasking machines available now that copy, scan, fax and print. Acquiring a multi-task machine instead of four different machines that can perform separate tasks can decrease your acquisition and maintenance costs. 6. Power down. A substantial amount of office electrical power is used by machines that are off, but still plugged into a live outlet. Think about your iPhone or Droid – note the reminder to unplug the charger? Standby or phantom power is a huge and generally an unnecessary expense. At the end of the day, turn off all computers and other office equipment that will not be utilized until tomorrow. And don’t forget to unplug your cell phone or laptop power cords from the outlet after your battery is fully charged. 7. Do away with screen savers. The photos and graphics may be lovely to look at, but in addition to being at times distracting, they can consume a lot of energy. Set monitors to hibernate after shorter periods of inactivity. Likewise, set monitors to power off after a lengthy period of non-use. Save money and distractions, but do not forget to enable the “auto save” feature on your computer’s hard drive so you do not lose any work in progress. 8. Use more natural light. Artificial lighting represents 40% of electricity consumption in typical offices, so opening blinds and enjoying daylight wherever possible makes sense. Hotels in Asia and Africa (where electricity is very expensive) are often built with large windows in the lobby and guestrooms to take advantage of the free daylight. New WalMart stores are being built with hundreds of skylights designed to replace many electrical fixtures during the daytime. 9. Install motion sensors. 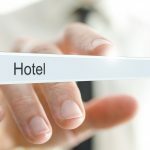 Many hotels have realized cost-savings by installing motion sensors in remote housekeeping and engineering closets and even on vending machines. Now many are beginning to place them in guestrooms and public restrooms. Evaluate your office and meeting space and notice how many rooms have lights on, even when empty. Instead of leaving it to people to turn off lights as they leave rooms (which they often do not do), install motion-activated light switches. These will turn lights on for a designated period of time (e.g., 15 minutes) whenever somebody passes in front of the switch or moves around in the space. 10. Switch to compact fluorescent bulbs. I could not believe the quick pay back, but compact fluorescent bulbs use about 75% less energy than incandescent bulbs, and they last about 10 times longer. Their costs have dropped dramatically as society has started to embrace this new lighting technology. With compact fluorescent bulbs you can save on energy consumption, replacement bulb costs, labor costs associated with more frequent replacement, and reduce overall waste as well. These bulbs are now available in almost all sizes and wattages, with softer sheens than earlier models. No changes in equipment are necessary, as just about any light that uses an incandescent bulb can instantly use a compact fluorescent bulb. 11. Look at reasonable bulk purchases. Costco, Sam’s Club, BJ’s and other warehouse-style stores have made it possible to obtain reasonable amounts of cleaning and office supplies, as well as office type foods (coffee, sugar, etc.). Check your area warehouse stores to see how much you can save on these types of items. 12. Consider “green” cleaning practices and products. Paper towels can be replaced by hand dryers in restrooms and affordable environmentally-friendly cleaning products. These protect the health of not only your cleaning staff but also your associates, while also reducing harmful substances and odors from the office. 13. Remember the Lessons of Craig’s List. Those independent hoteliers I mentioned in the opening did not have the ease of Craig’s List, eBay or other online search options for sourcing unique items; but they often went to auctions and sales. They found many one-of-a-kind items at rock bottom prices they were able to use in many different ways. Use the Internet to search for unique items that you cannot find through traditional retailers, but don’t forget to stop every now and then at auctions and sales to see if you can snag yourself a bargain.